- they express eternity, desire and love. 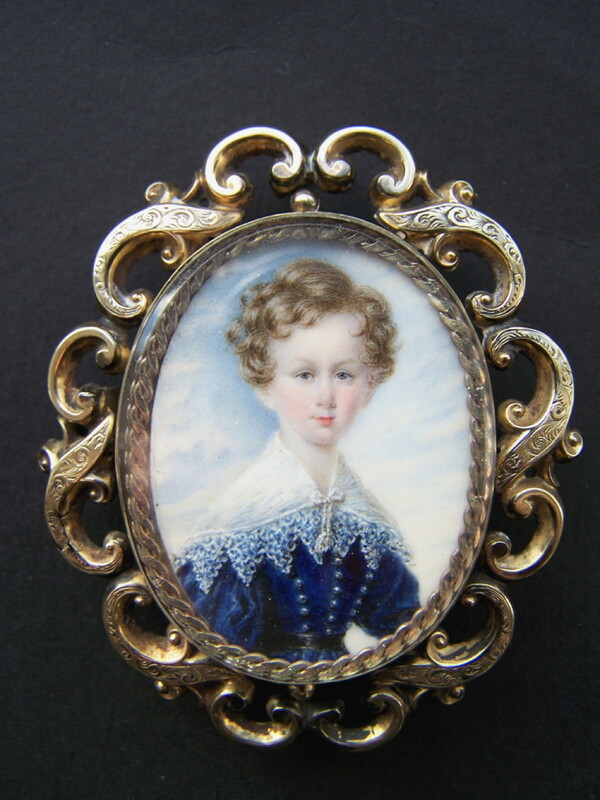 Scroll down and click on any miniature for a larger image. I only have delighted customers - if you are not fully satisfied with your purchase I refund your money - "dictum meum pactum". 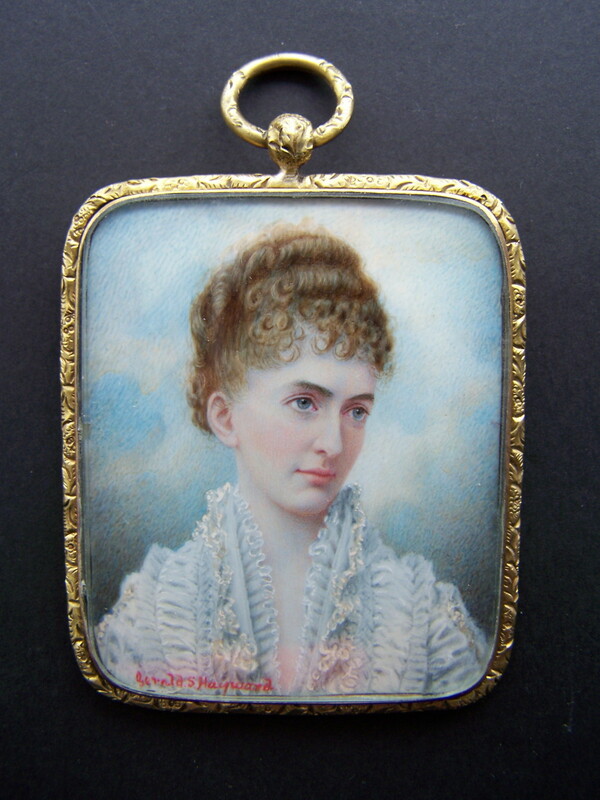 My portrait miniatures are only available from my website. 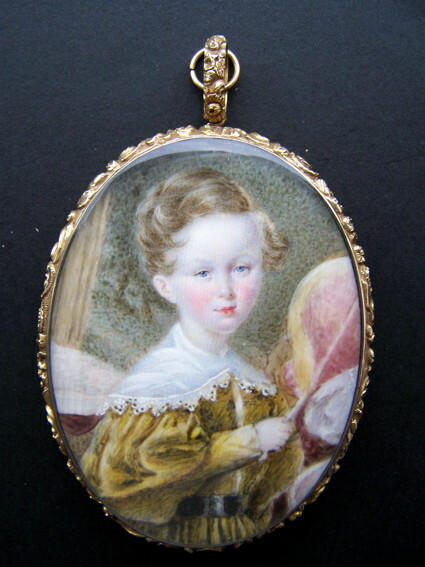 Scroll down and click on any miniature for a larger image. Watercolour. Size: 90mm x 65mm. Please ignore camera reflection on her dress. 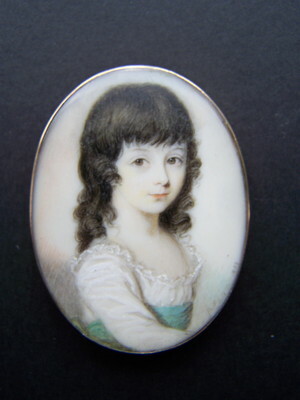 A young lady wearing a pale green dress. Signed and dated: 'Hugh Nicholson 1896'. 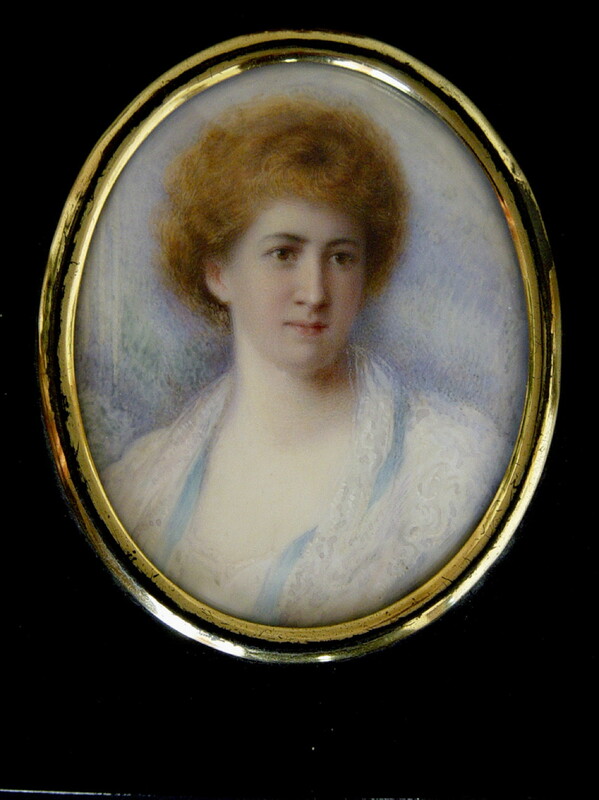 Sitter: Mrs W G Pirrie nee Carlisle. Watercolour. 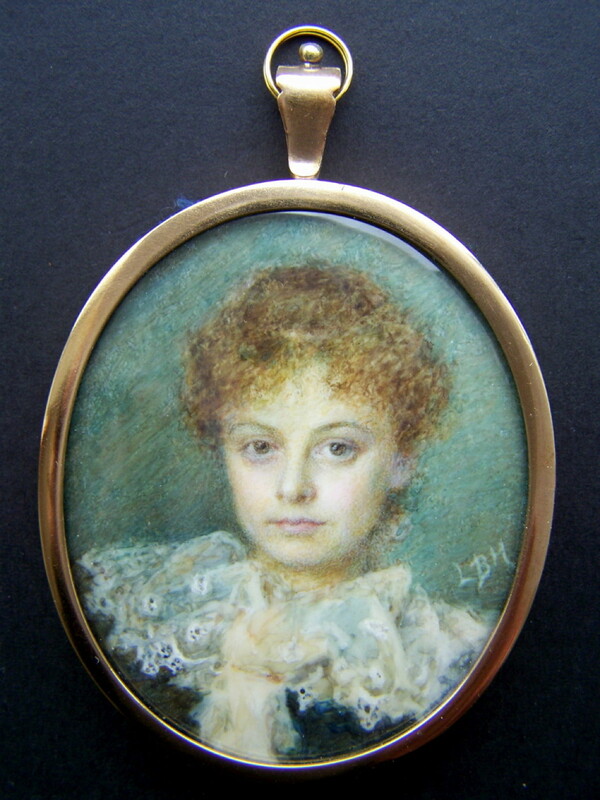 Oval, 90mm high. Gilt-metal frame. See pages 242/243 'Dictionary of Miniature Painters 1870-1970'. 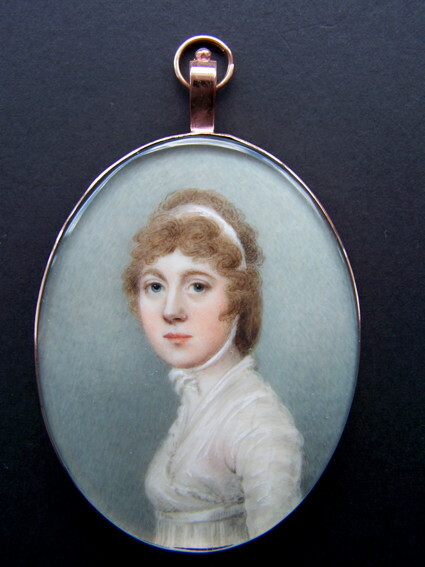 members of the Royal Miniature Society. Page 242 - 'Dictionary of Miniature Painters 1870-1970'. 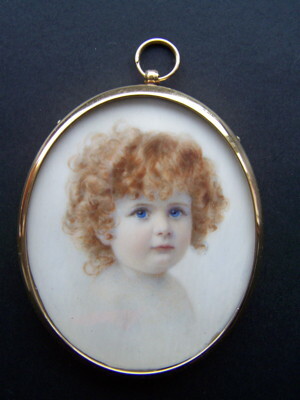 A young boy with red hair. Signed and dated: 'Annie Howard 1896'. 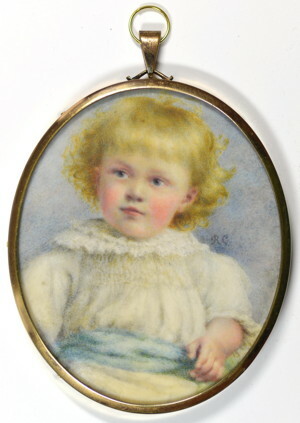 4th Baron Cheylesmore aged 3. Google for details. Watercolour. Engraved gold frame. Oval, 70mm high. See page 91 'Dictionary of Miniature Painters 1870-1970'. 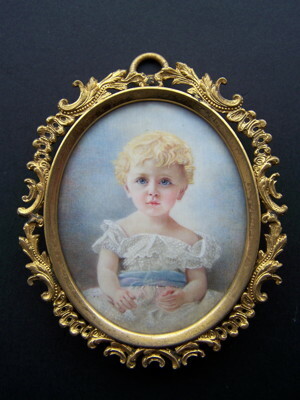 Annie exhibited before 1870-1900 RA, SM. 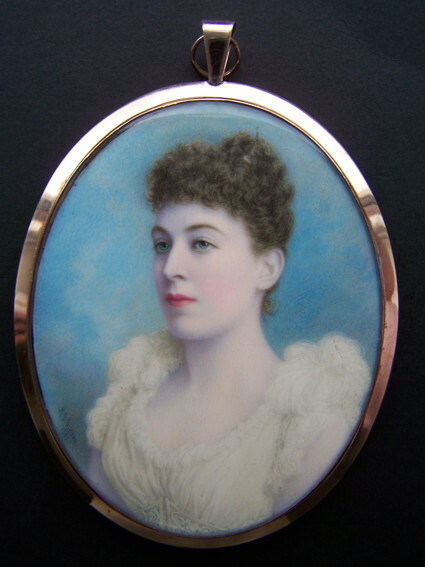 A young lady wearing a white gown. 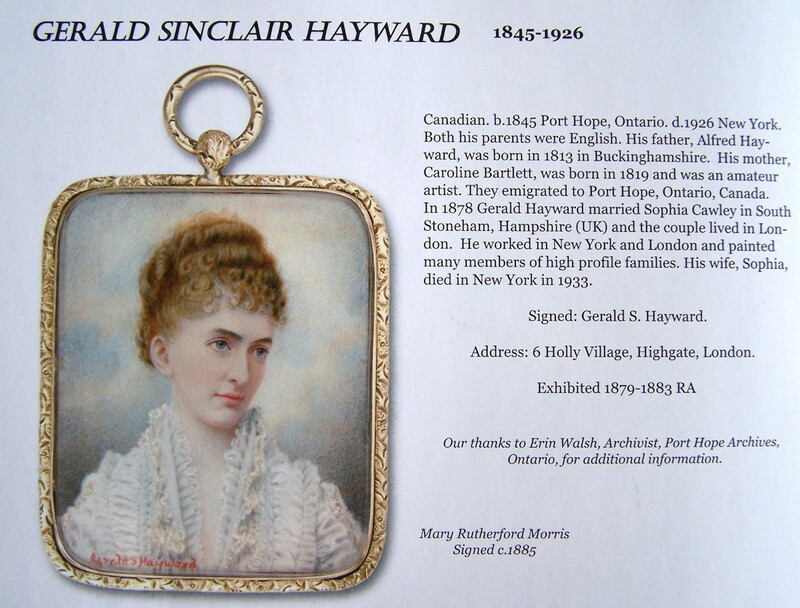 Signed: 'Gerald S Hayward' to obverse. 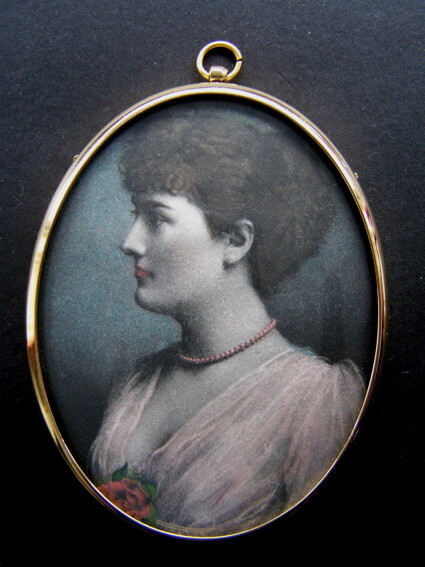 c1895. Sitter: Mary Rutherford Morris - grand-daughter of Governor Morris. Watercolour. Size: 64mm x 53mm. See page 214 'Dictionary of Miniature Painters 1870-1970'. Page 214 - 'Dictionary of Miniature Painters 1870-1970'. 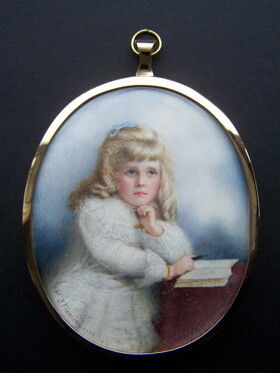 A young lady wearing a blue dress sat at her reading desk. - underneath the table's edge. to the reverse - see image below. Watercolour. Acorn frame with gilt-metal surround. Image size - 73mm x 55mm. 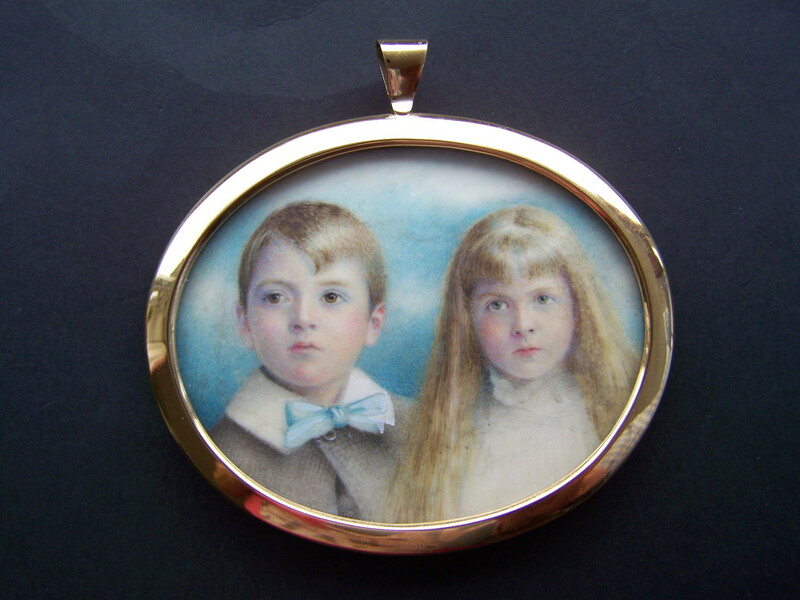 With acorn frame - 125mm x 110mm. 'Miniatures Dictionary and Guide' Daphne Foskett. The background is paler and more uniform than my image. The back of the acorn frame has some inscription. 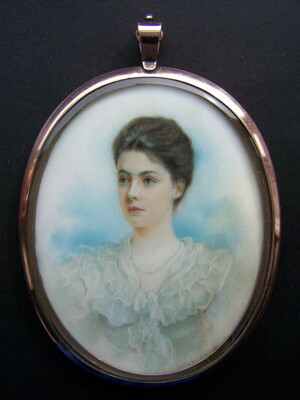 A young lady wearing a pale blue dress. 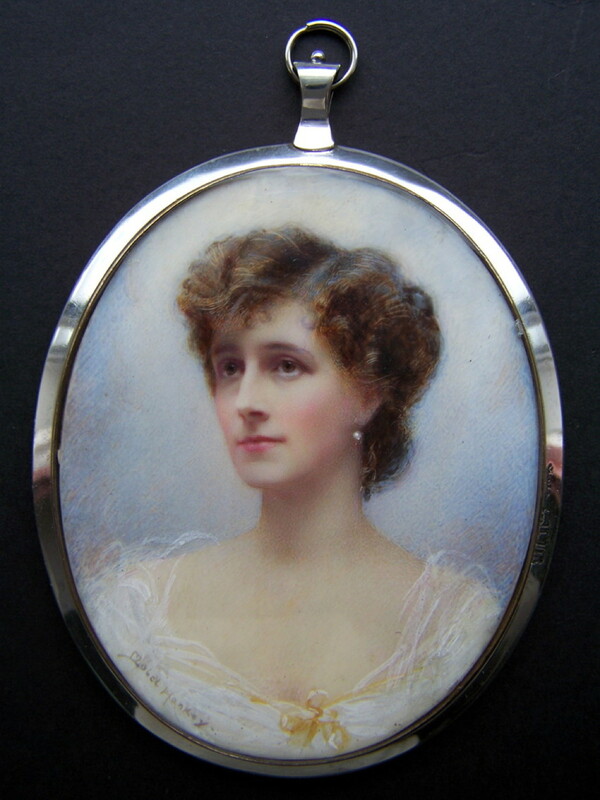 c1910. Signed: 'G E Bagly' to the obverse - bottom left. Watercolour. Gilt-metal frame. Oval, 70mm high. 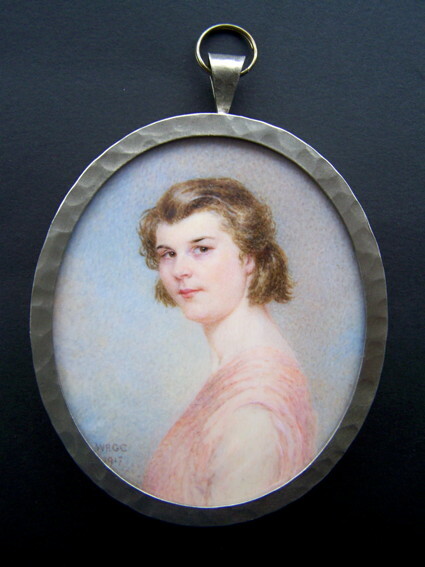 A young lady wearing a pink dress and pearl necklace. Signed: 'W Gabrielli' to the obverse. c1915. 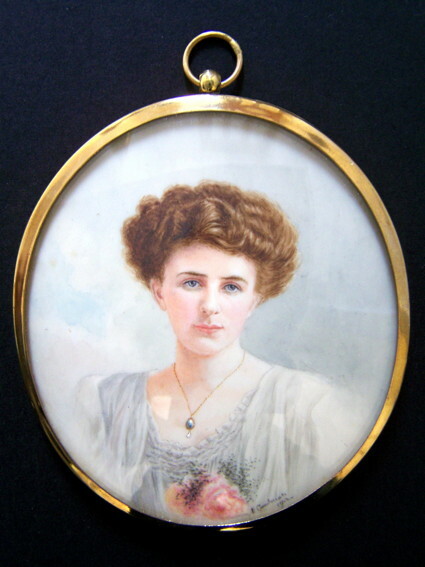 Miss Winifred Cecile Dongworth 1893-1975.
and a necklace of green beads. Signed: 'W Dongworth' to the obverse. See page 197 'Dictionary of Miniature Painters 1870-1970. Winifred exhibited 1914-1950's RA, RMS. Page 197 'Dictionary of Miniature Painters 1870-1970'. A young lady wearing a white dress and fur stole - c1915. Signed: John Stewart Clark to obverse. See page 185 'Dictionary of Miniature Painters 1870-1970'. 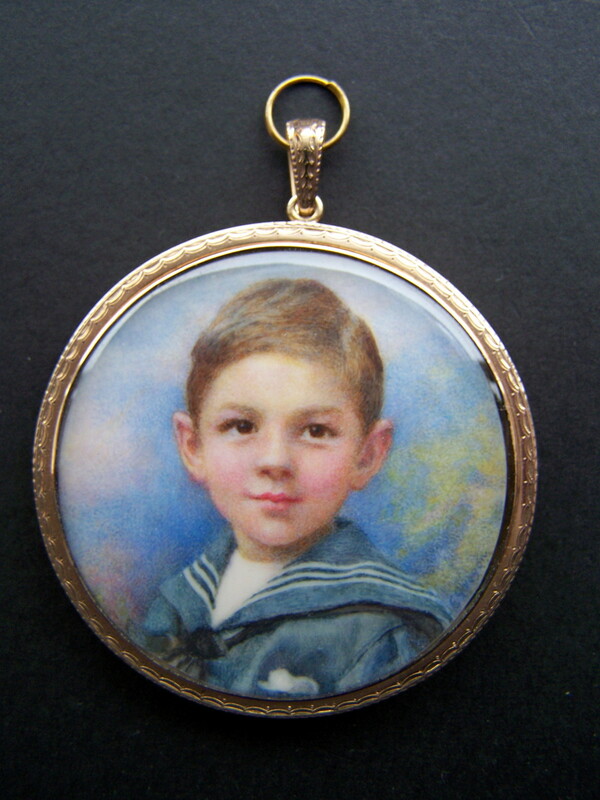 John exhibited 1899-1937 RA, RMS. Page 185 'Dictionary of Miniature Painters 1870-1970'. 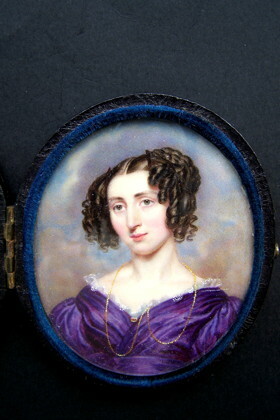 Mrs G R Ward - active 1823 to 1849.
black dress with white lace collar. Watercolour. Image size: 93mm x 73mm. Skin tones on face much better on actual miniature. Signed: 'RMK' to the obverse. fitted display case with hinged back strut. Image size: 90mm x 70mm. Miniature in case - see above. 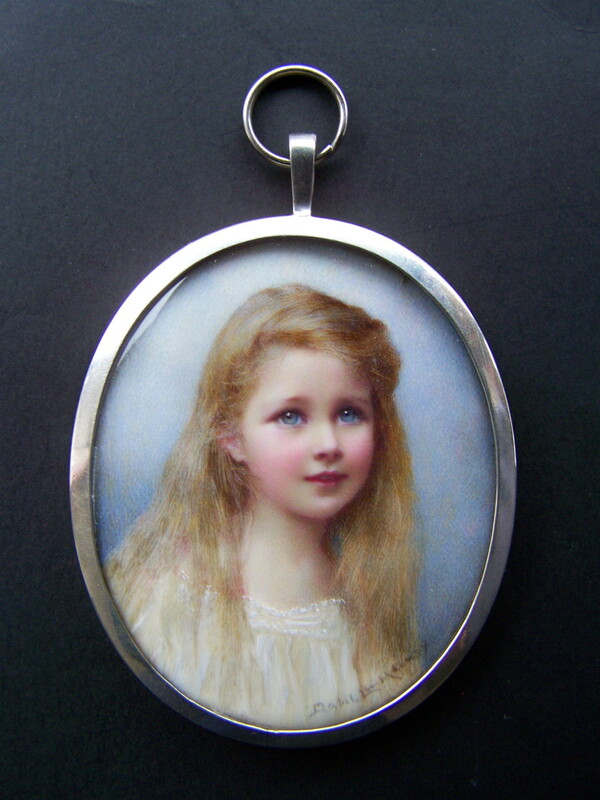 Miss Mary Josephine Gibson 1855-1934. Signed: M J Gibson 1892' to obverse. Original gold frame. Watercolour. 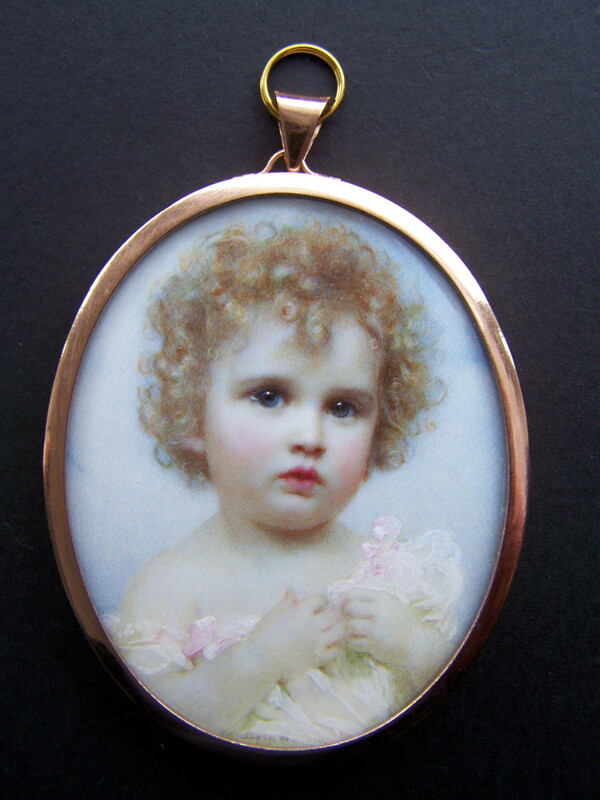 Oval, 86mm high. See page 72 'Dictionary of Miniature Painters 1870-1970'. Mary exhibited 1885-1924 RA, RMS. A young lady with dark hair. Signed: Geo. 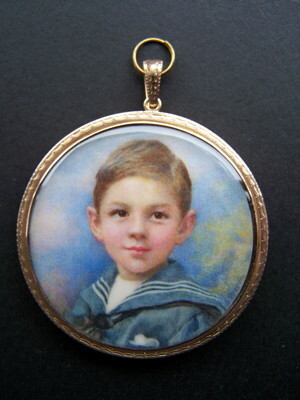 H Burgess to obverse. Watercolour. Image size 105mm x 73mm. 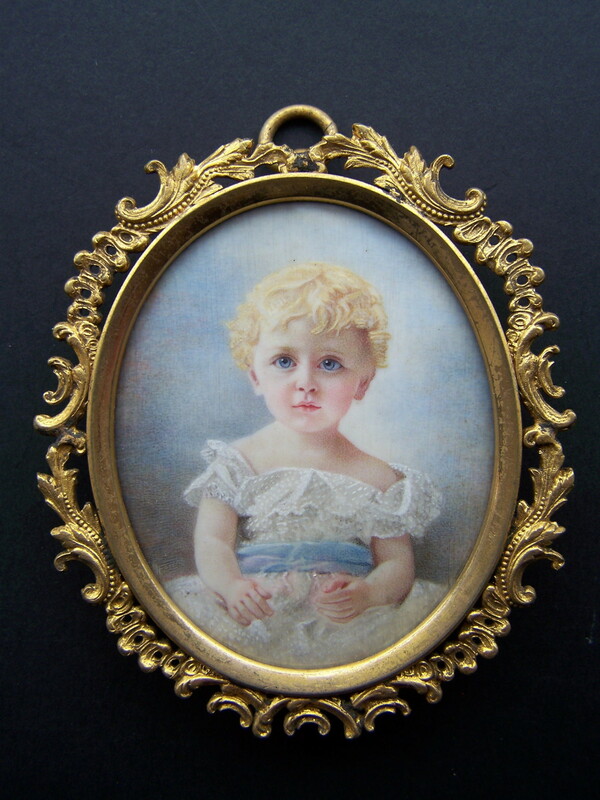 Size with gilt-metal frame - see below - 185mm x 145mm. George was a noted portrait artist in California. 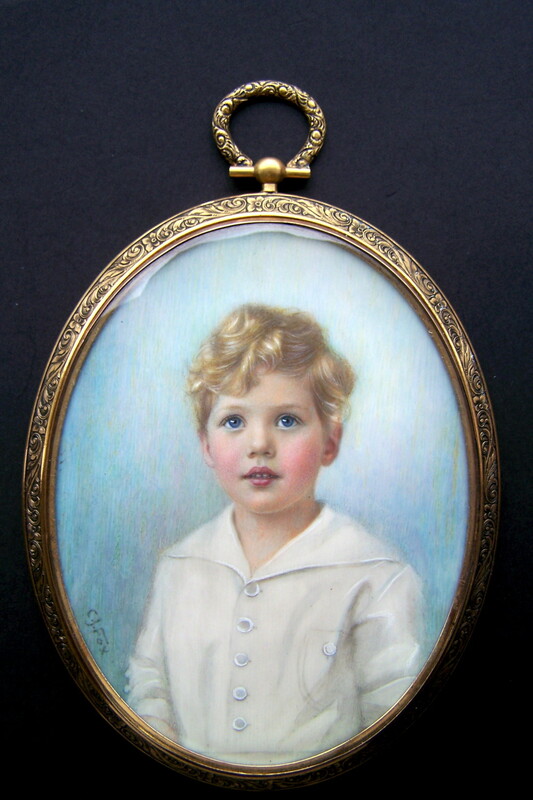 He is also well known for his paintings of the gold rush. Pierced gilt-metal frame with coloured paste stones. 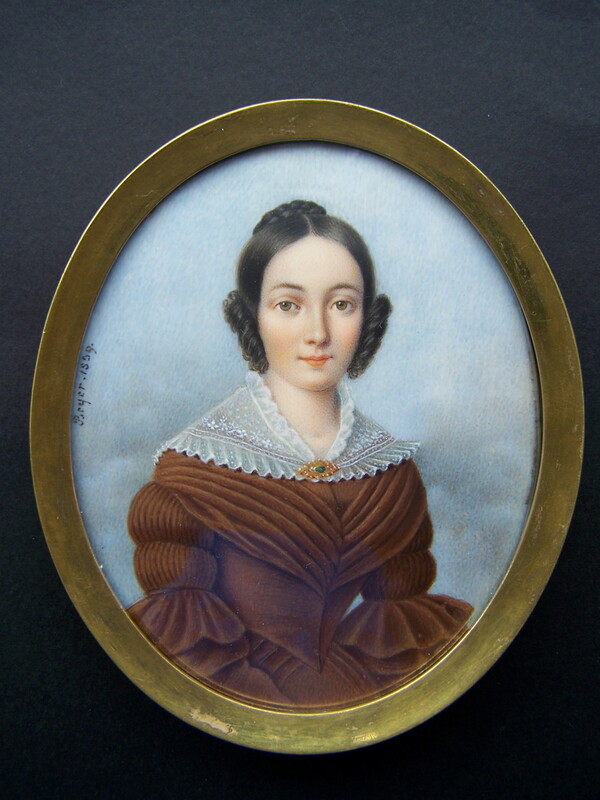 Continental School - circa 1830.
her brown hair elaborately curled and upswept. Watercolour. Gold frame. 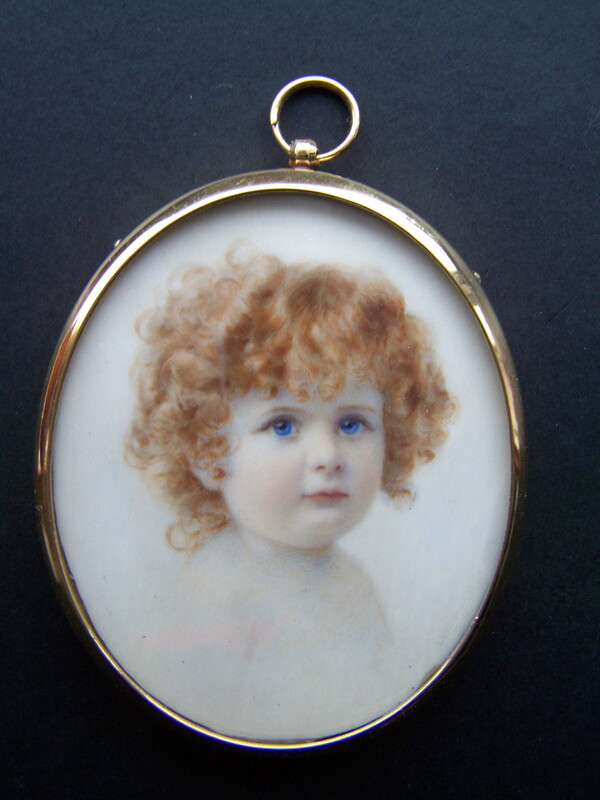 Oval, 65mm high. than on my image. See top edge of her dress. 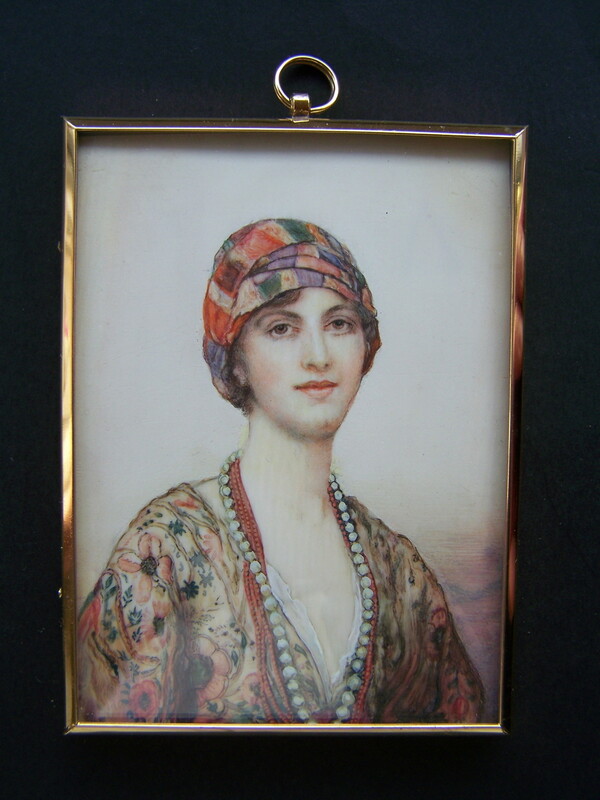 Beautiful Georgian lady wearing a white dress and pearl necklace. Watercolour. Oval, 75mm high. 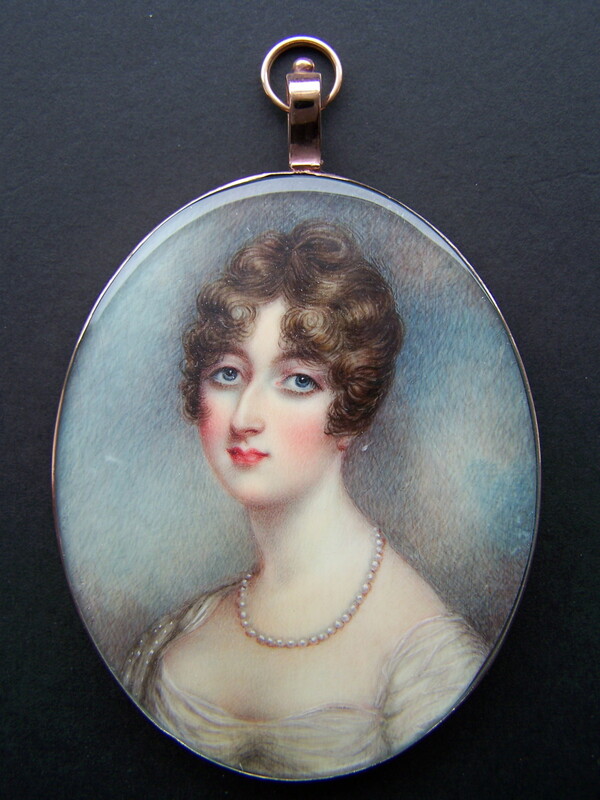 c1820. 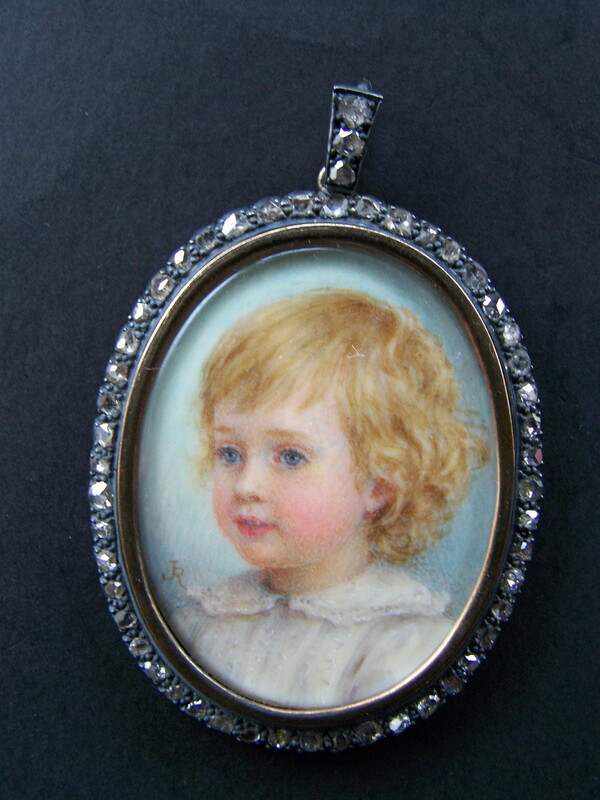 Ignore light reflection to top of miniature. The background is a more subdued colour. J T Mitchell fl. 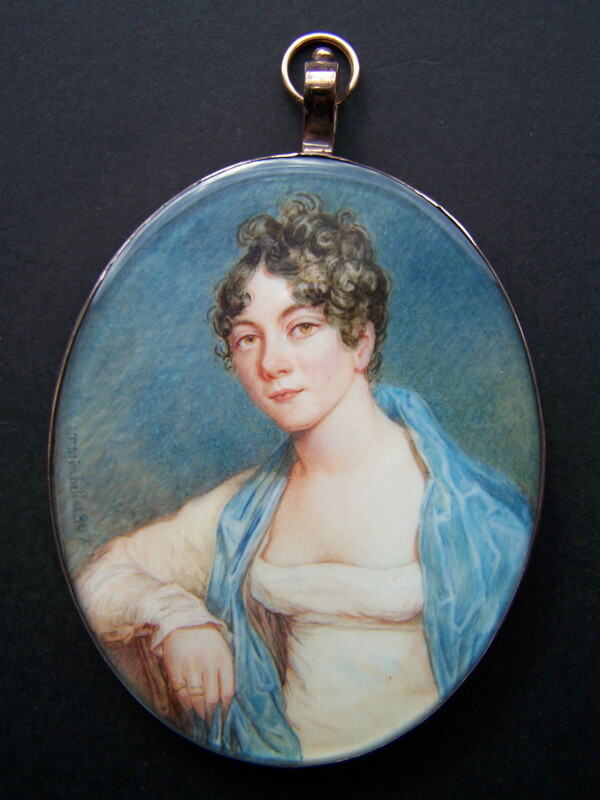 1798-1830. 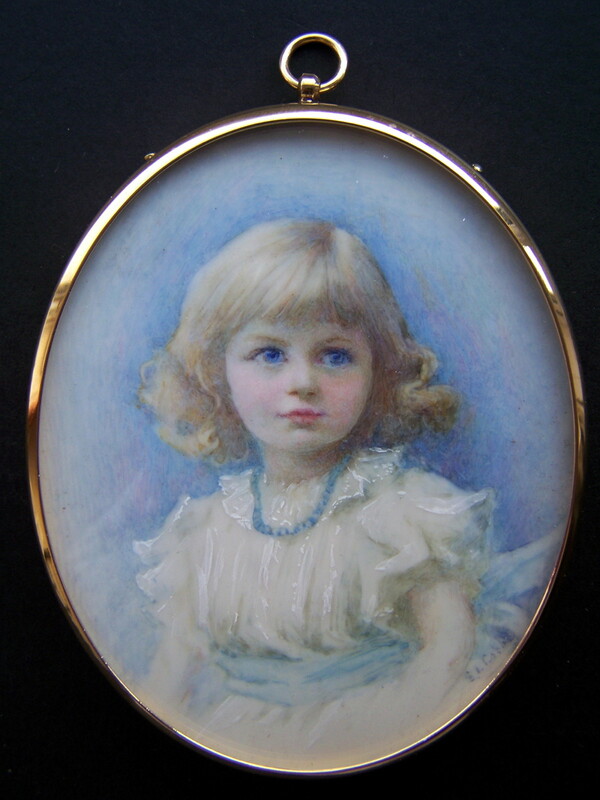 A young lady wearing a white dress and blue shawl. Watercolour. Solid back gilt-metal frame. Signed: 'Burt' to obverse. 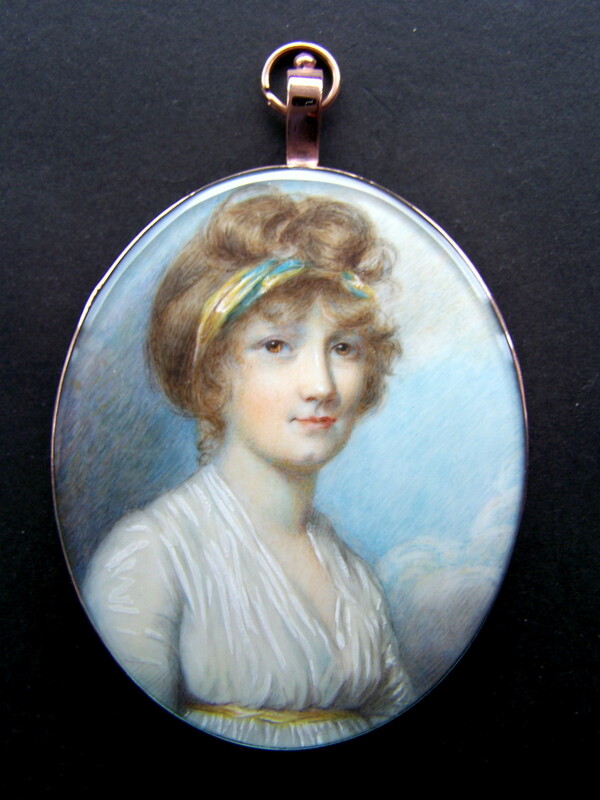 c1810. 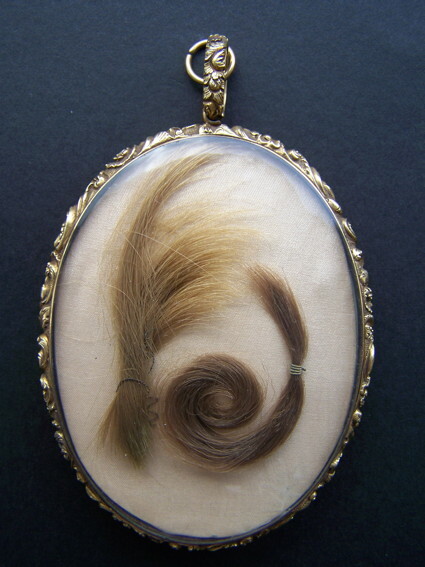 Gold frame with woven hair to reverse. 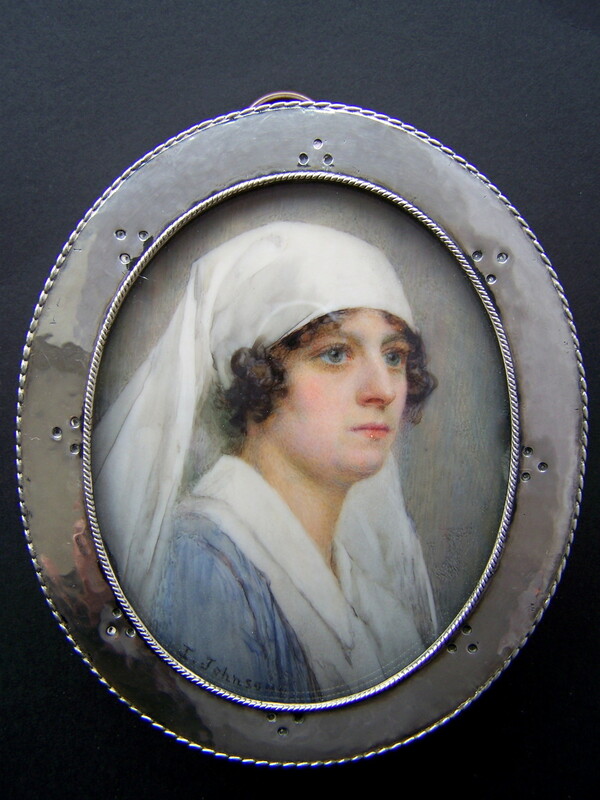 Beautiful young Georgian lady wearing a white dress and head band. Beautiful young lady wearing a brown dress with lace collar. Signed: 'Beyer and dated 1839'. with marabou trim to her decollage, her brown hair curled and upswept. 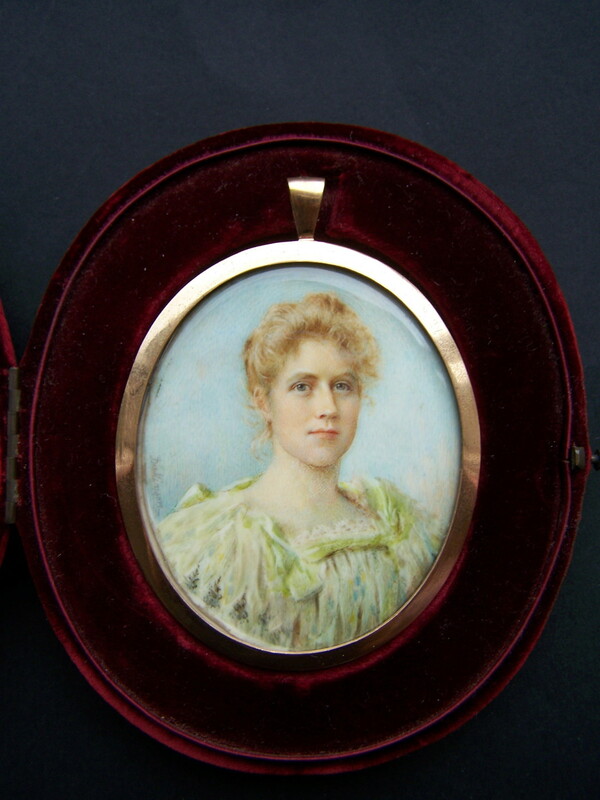 Signed on the obverse and dated - 'M J Gibson 1891'. 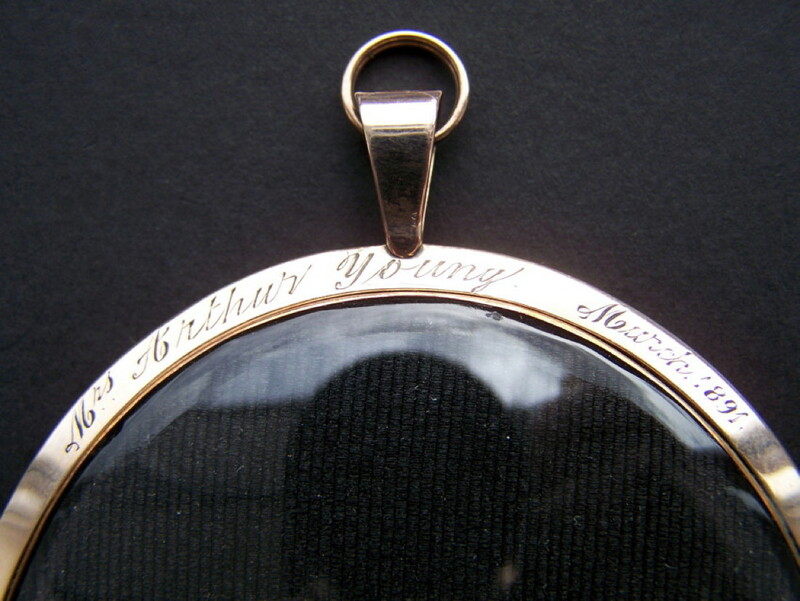 The rim to the reverse engraved 'Mrs Arthur Young - March 1891'. Gold frame. Watercolour. Oval, 90mm high. 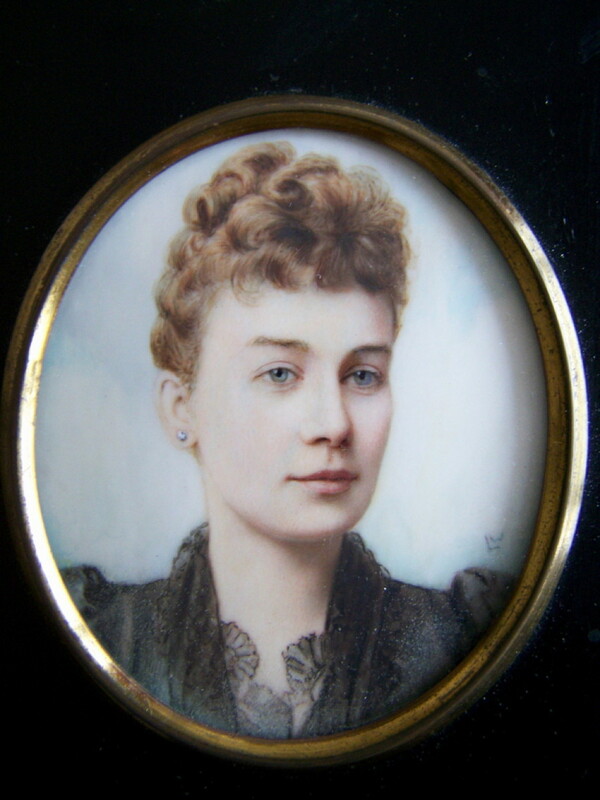 'Mrs Arthur Young - March 1891'. 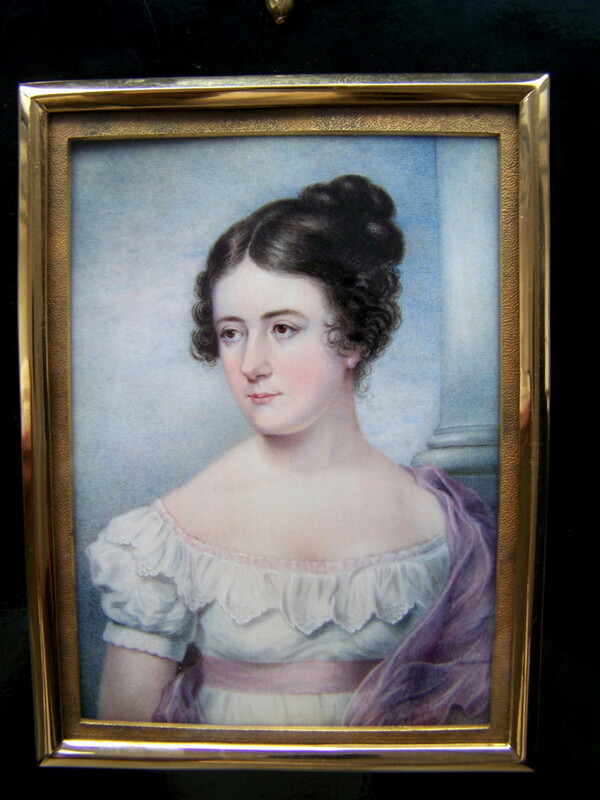 A young lady wearing a pink dress. 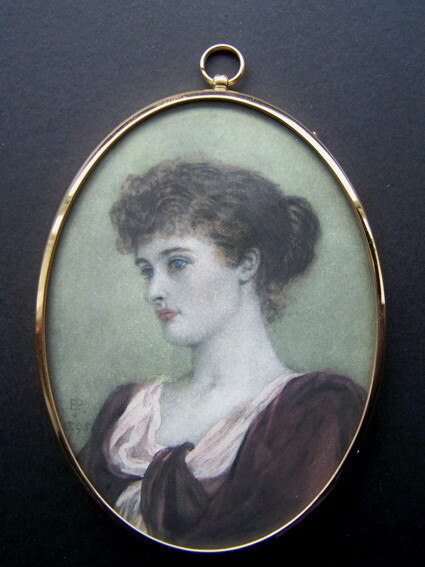 Gilt-metal frame. 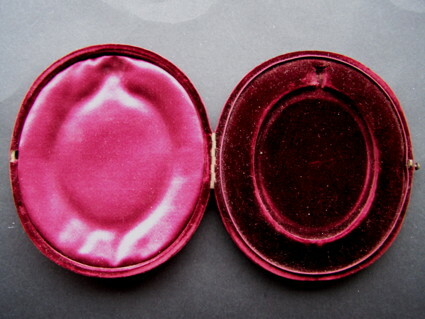 Oval, 80mm high. A young lady with her dark hair upswept. 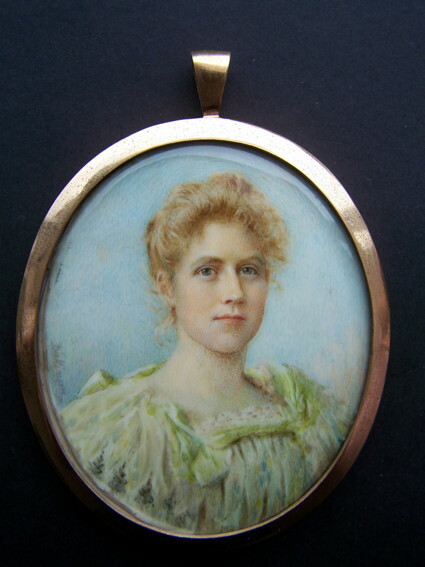 Signed on the obverse and dated - 'M J Gibson 1897'. Silver frame the reverse with blue enamel. Stunning, beautiful and fashionable young lady. 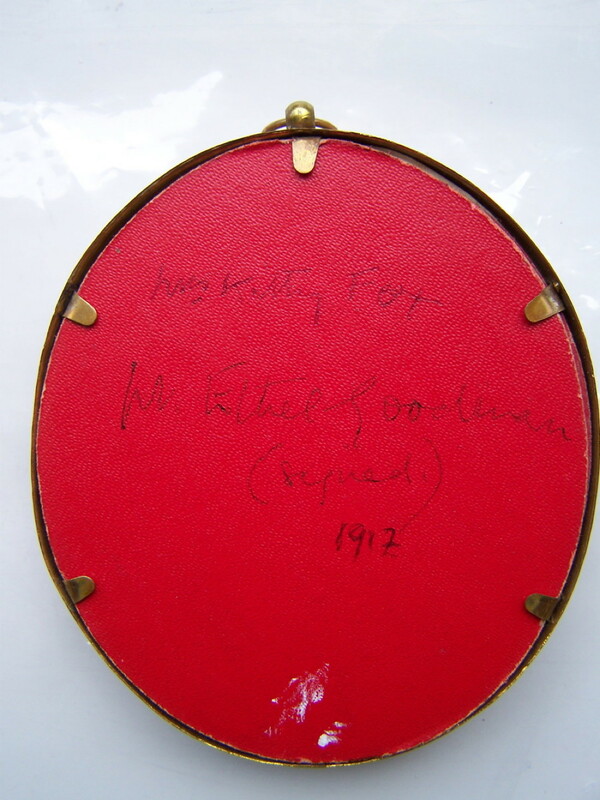 Signed to obverse: 'E J R 1895'. Watercolour on card. Oval, 97mm high. See page 138 'Dictionary of Miniature Painters 1870-1970'. 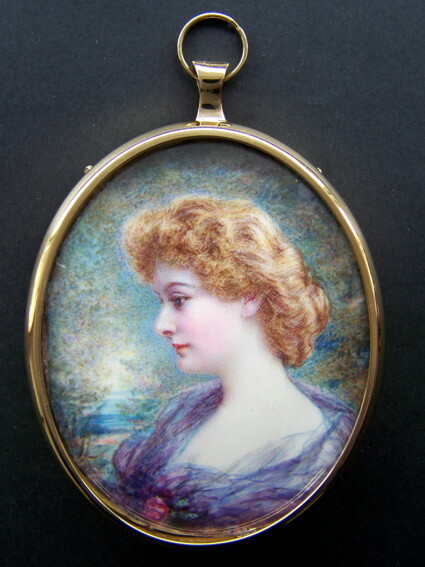 Ethell exhibited 1883-1909 RA, RMS, SM. A beautiful young Edwardian lady wearing a pearl necklace. Watercolour. Oval, 80mm high. 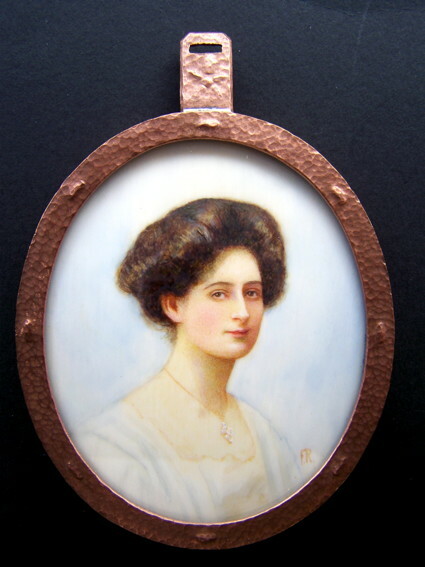 c1910. Attributed to Alyn Williams 1865-1955. 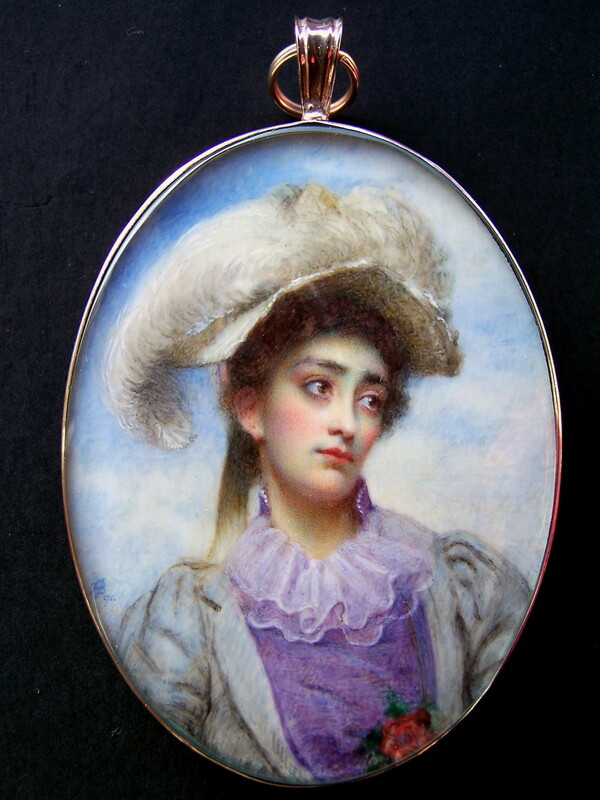 A young lady wearing a pearl necklace. Charles & Walter Padgett, London 1904. See page 274/275 'Dictionary of Miniature Painters 1870-1970'. and had a very successful career on both sides of the Atlantic. Reverse of above with paper label. Sitter - Madame Lepole Savory. Watercolour. Image size 140mm x 110mm. Exhibited in Royal Academy - catalogue no. 1369. See page 162 'Dictionary of Miniature Painters 1870-1970. 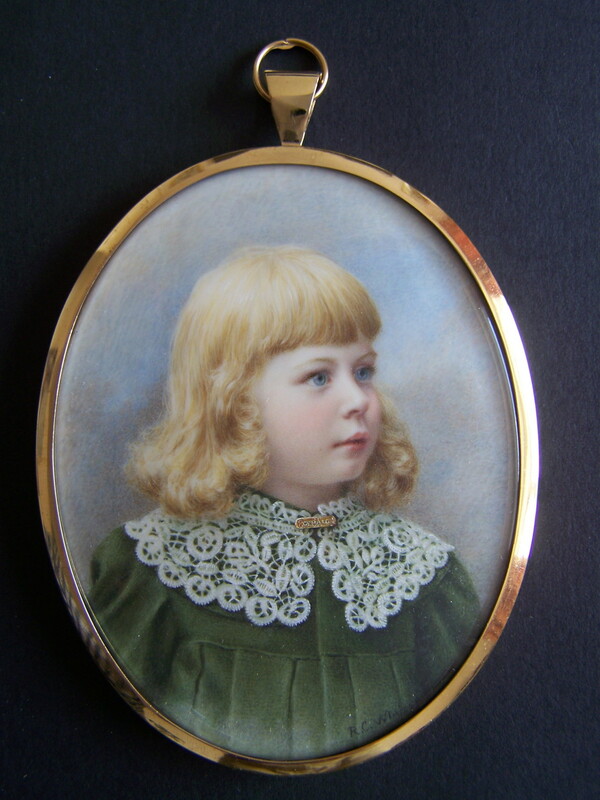 A beautiful young lady wearing a green dress. Her blonde hair upswept in the fashion of the time. Signed to the left edge 'Dickinson'. c1905. red velvet case with easel stand to back. Miniature in right hand section of red velvet case. is on the right section and in 4a - above. later Baroness Dunalley of Kilboy by society miniaturist Ernest Rinzi. Ernest had a wealthy clientele and was very prolific. See page 203 'Dictionary of Miniature Painters 1870-1970'. The black circle is our camera lense! 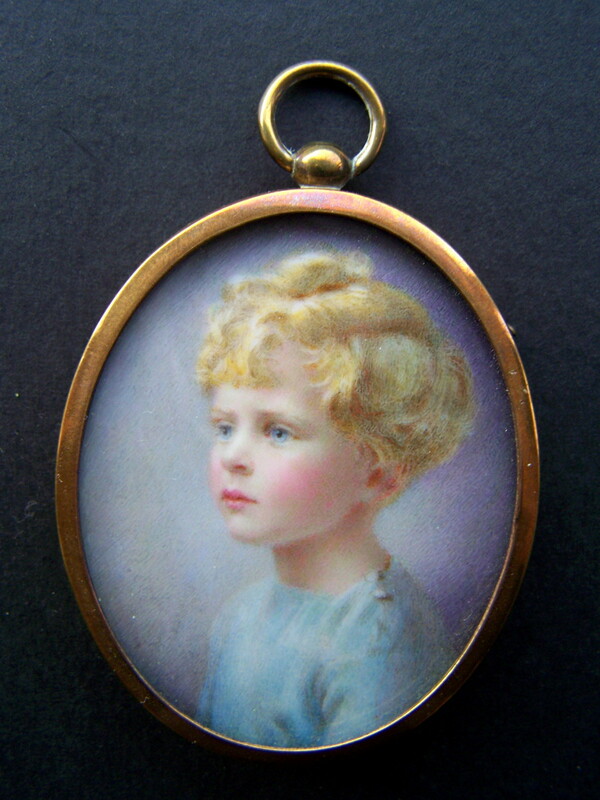 A delightful miniature of a young boy holding a drum stick. Good quality gold frame. Watercolour. Oval, 75mm high. 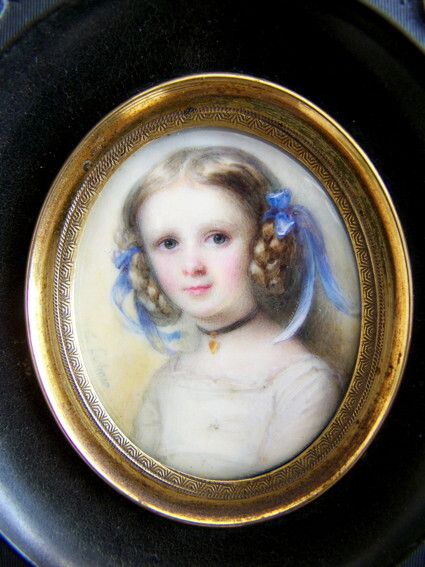 Attributed to Miss Emma Eleonora Kendrick c. 1788-1871. 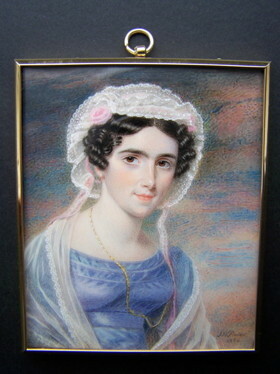 A beautiful young lady wearing a white dress and pink shawl. Watercolour. Gilt-metal frame. Size 90mm x 65mm. See page 581 'Miniatures - Dictionary and Guide' Daphne Foskett. 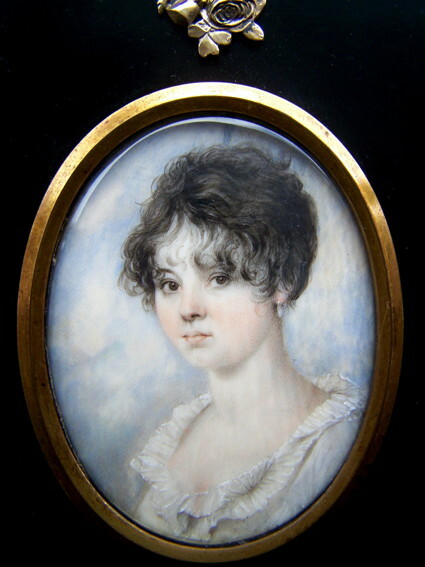 Emma exhibited at the Royal Academy 1811-1840. Beautiful young lady named 'Jessica'. Signed: 'WHGC 1917' to obverse. Original frame. Watercolour. Oval, 75mm high. See page 51 'Dictionary of Miniature Painters 1870-1970'. A lovely miniature of a confident and successful young lady. The sitter is actress and stage star Marie Lohr. c1910. 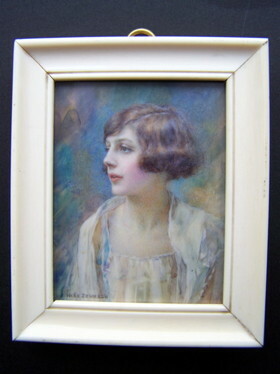 Google for more images and her career. Original frame. Watercolour. 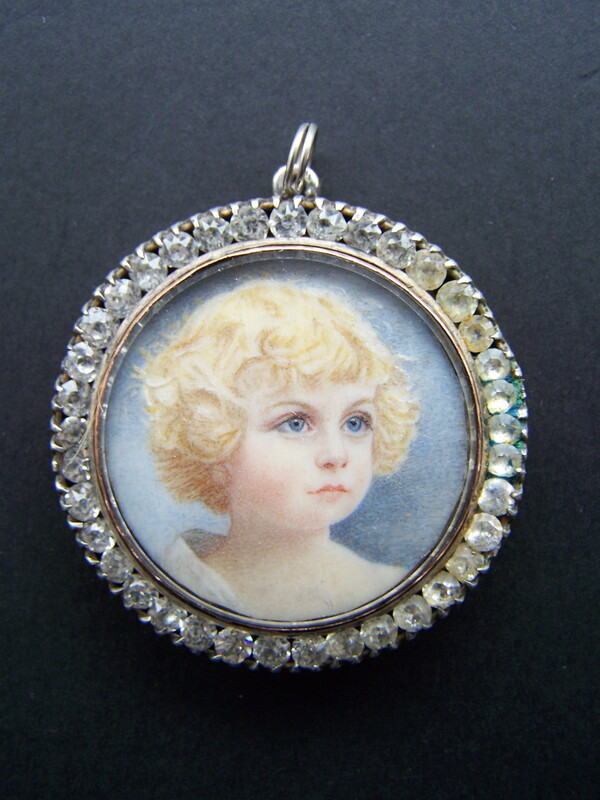 Oval, 63mm high. See page 136 'Dictionary of Miniature Painters 1870-1970'. A young boy wearing a blue costume - circa 1830. Watercolour. Gold plated frame. 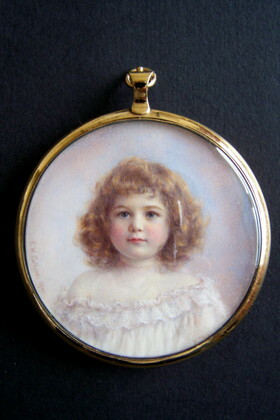 Oval, 40mm high. 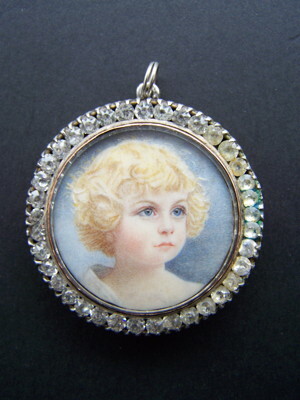 which is engraved, it has a brooch arm and clasp to the reverse. 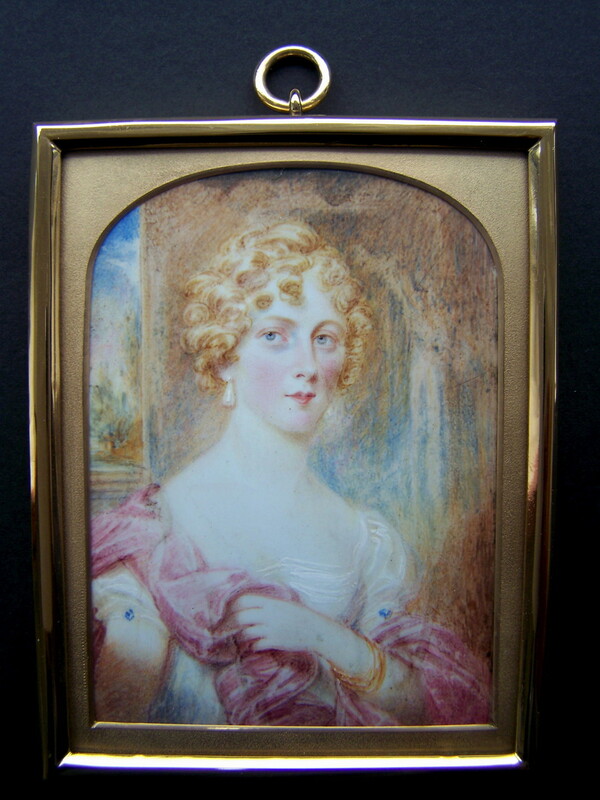 Silver gilt frame. Watercolour. 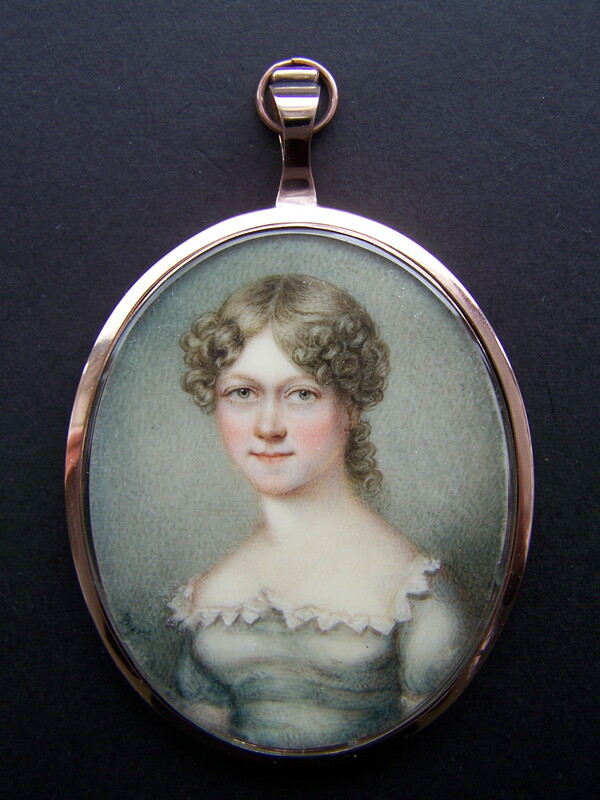 Oval, 40mm high. Google sitter's name for details of his family etc. An 18th century gentleman wearing a blue jacket - c1785. 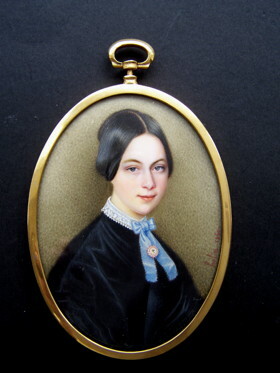 A young lady wearing a black dress. Label on reverse identifies sitter as Mrs Dolly Williams. 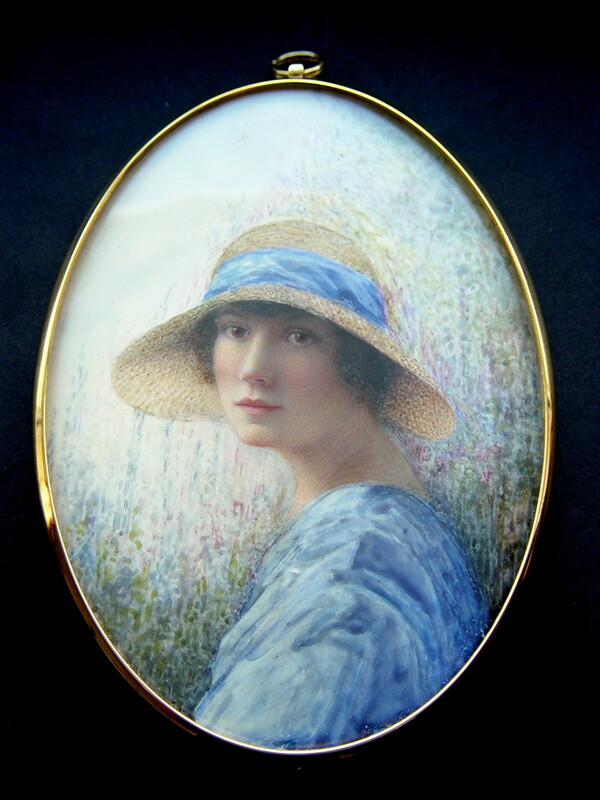 A young lady wearing a blue bandeau - c1910. Signed: P Netterville to obverse. 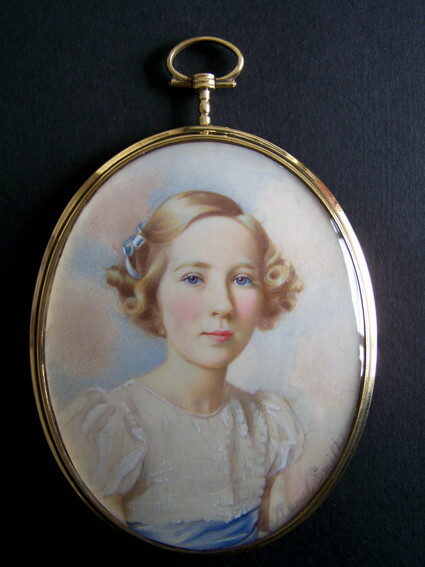 A young lady wearing a white dress and pearls to her neckline. Signed: H F Rock 1914. See page 137 'Dictionary of Miniature Painters 1870-1970'. turquoise dress with a red rose at her corsage and pearls. 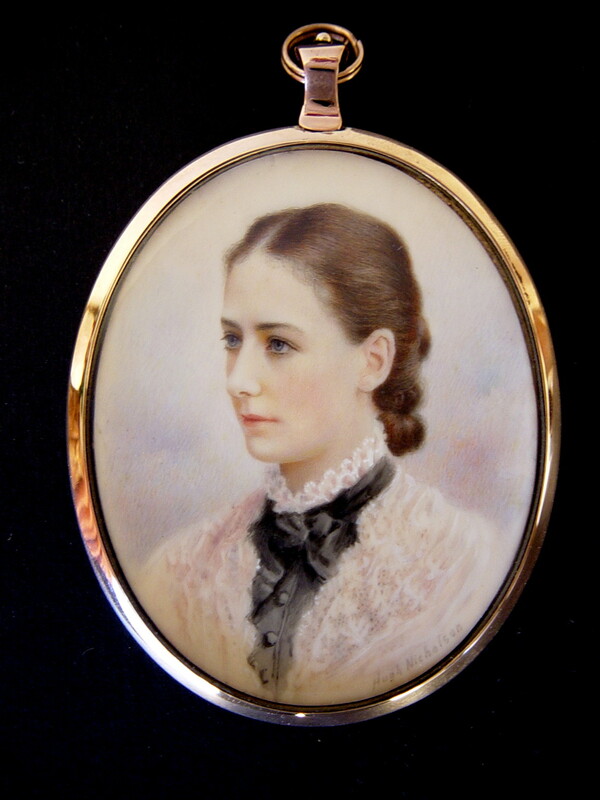 This beautiful woman is Emily Walton, Lilian's mother. 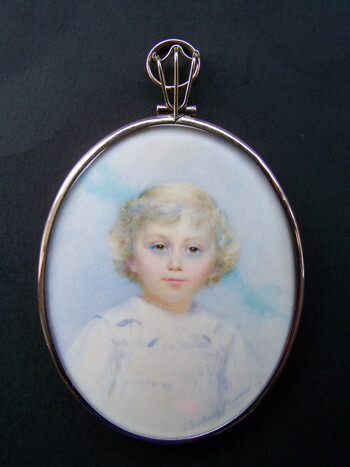 Lilian painted the sitter from an old photograph. with easel reverse 155mm x 125mm. 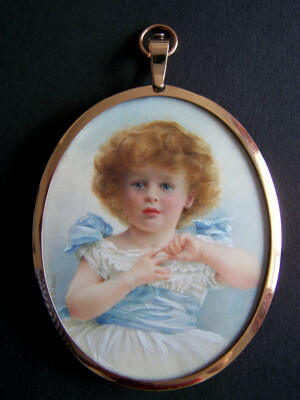 wearing a white dress and a gold necklace. Her long hair is worn swept up. Signed: - F.R. - Francis Reily. c1900. Original Arts & crafts frame. Southport School of Art. 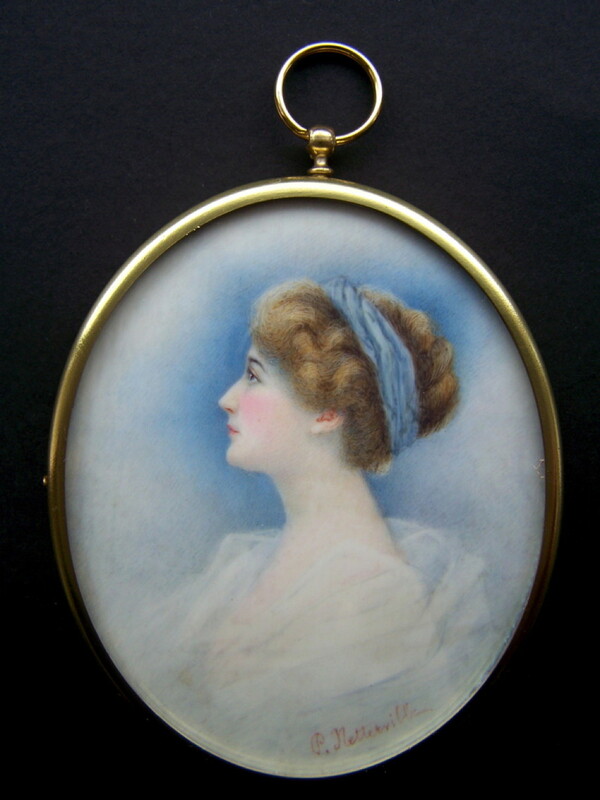 Exhibited 1884-1919 RA. See page 135 'Dictionary of Miniature Painters 1870-1970'. with a very fashionable period hairstyle - named Miss Kitty Fox. Signed and dated E Goodman 1912 on the obverse. Watercolour. Oval, 95mm high. 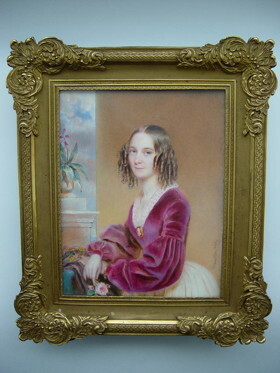 Original gilt-metal frame. 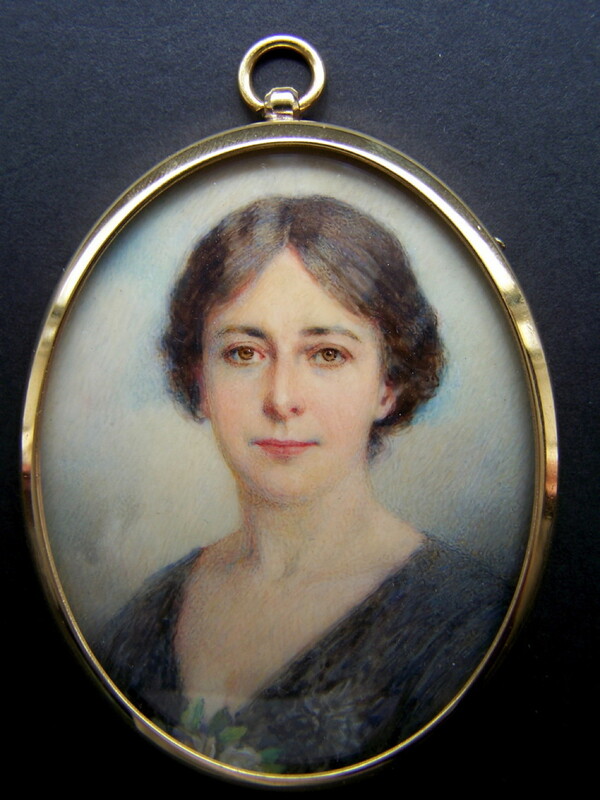 Ethel exhibited at the Constable Art Club in 1914. See page 208 'Dictionary of Miniature Painters 1870-1970'. Ignore camera reflection across the miniature. a pink rose to her corsage her hair loosely upswept. Oval, 76mm high. 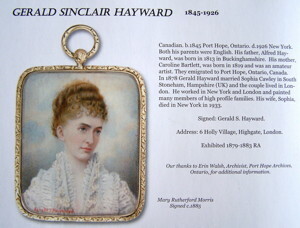 Gilt-metal frame. wavy fair hair tied with a black ribbon bow. Signed: - E M Cannon on the obverse. Watercolour. Oval, 80mm high. 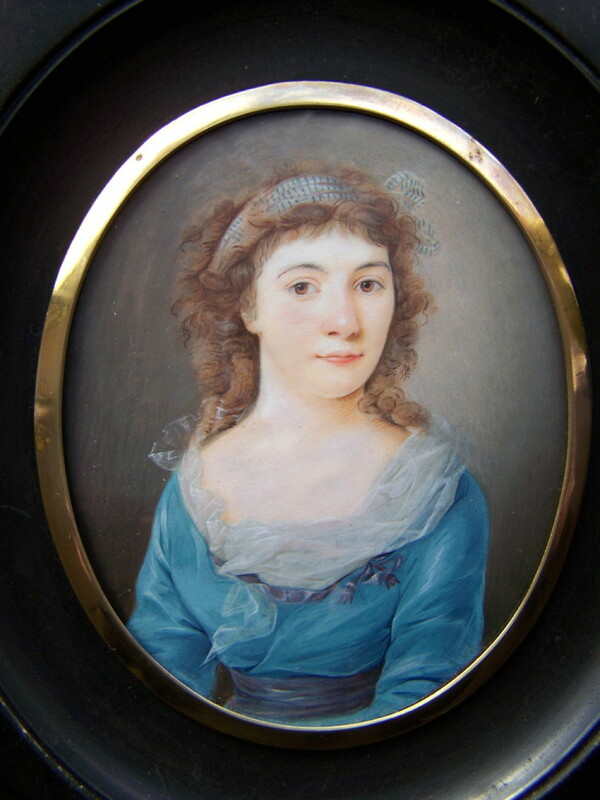 Gilt-metal frame. The artist lived at 7 Windsor Road, Ealing, London. 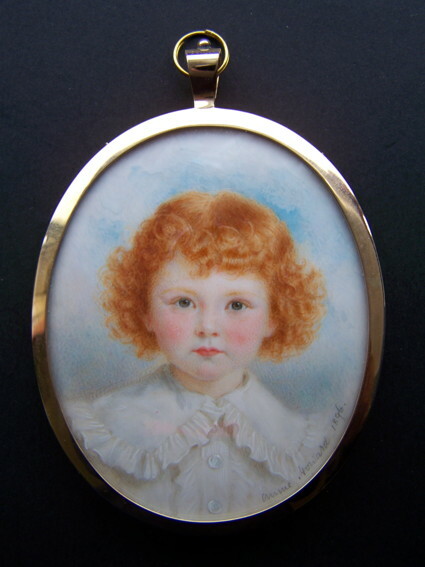 See page 41 'Dictionary of Miniature Painters 1870-1970'. threaded with pale blue ribbon. 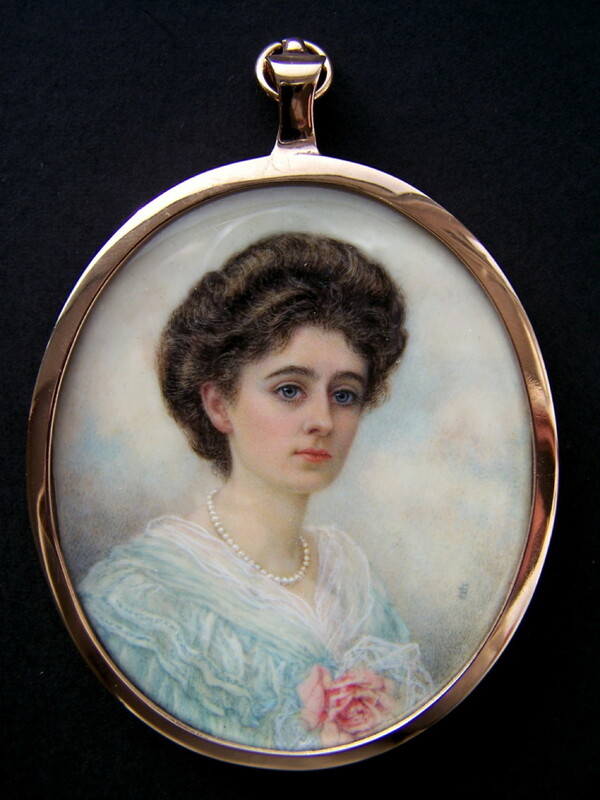 c1900. 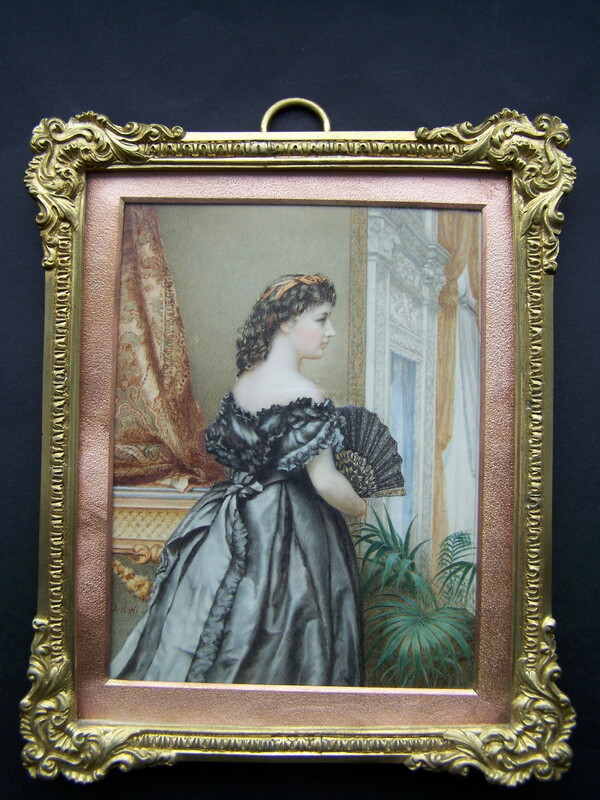 Set in a gilt-metal surround in a wood acorn frame 145 x 120mm. 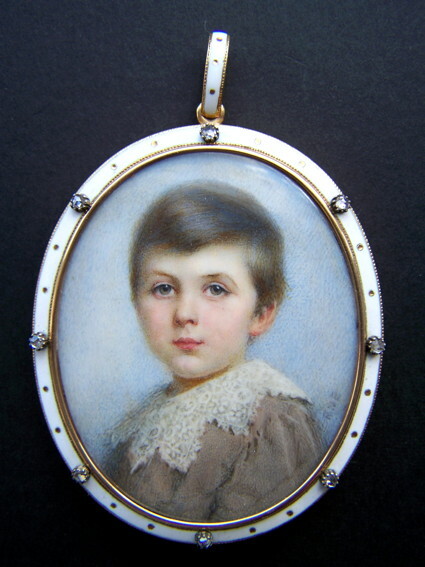 A young child. Signed: 'E Brisley 09' to obverse. See page 35 'Dictionary of Miniature Painters 1870-1970'. 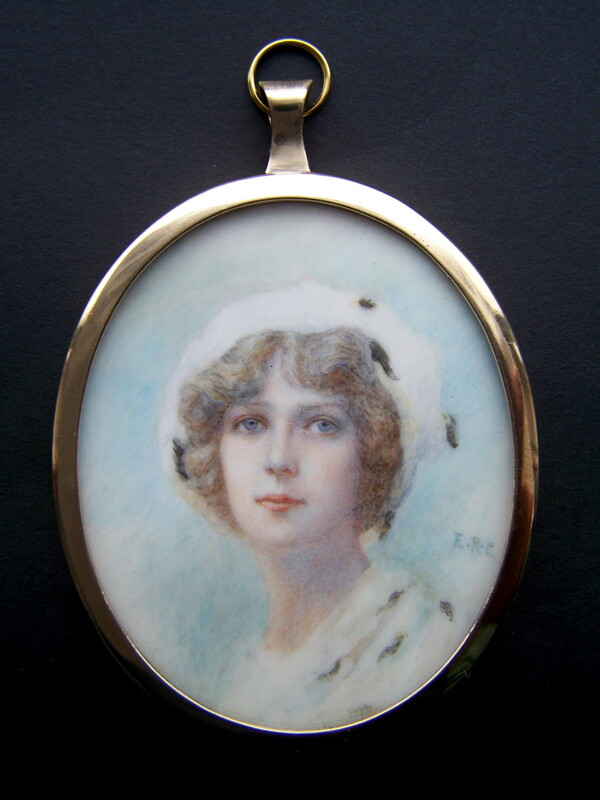 Ethel exhibited 1908-1940 RA, RMS.